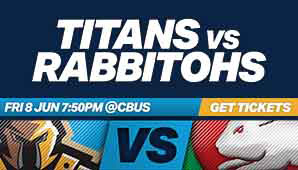 The South Sydney Rabbitohs return to the Gold Coast for the first time in three years for a massive clash against your TFH Gold Coast Titans! With a new coach, new recruits, Greg Inglis returning from a season-ending injury and the bash brother Burgess boys in their squad, this game shapes as an absolute humdinger – and on a Friday night to boot! What better way to start your weekend than to head out to Cbus Super Stadium on a Friday night to watch the best rugby league competition in the world in our own backyard! Share in all the fun of TFH Titans home matches with the Titans Fan Zone, kids on the field post-match, pre-match and half-time entertainment and the best viewing experience in the National Rugby League! Dedicated seating bays available for opposition fans!